Backup files and rename them with one simple click! How many times a day do you have to do this to make a backup copy of a file ? Find the file in Windows Explorer. Rename the file they way you want it to be. Create a sub-directory to hold the backup copies. Move your backup copy into the sub directory. 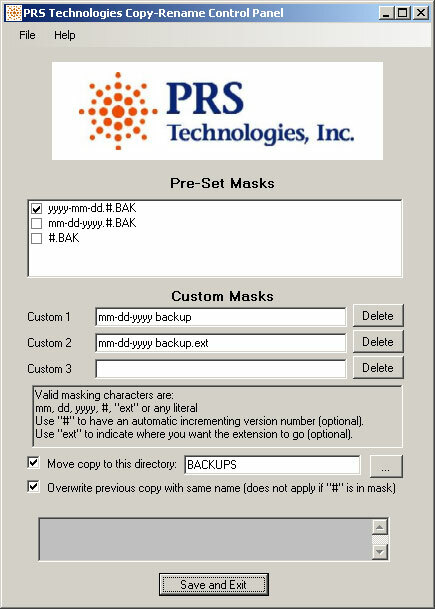 Now you can eliminate all those steps with one simple click using the PRS Tech Copy-Rename Utility. Here are the three simple steps to end all that hassle. Download and install the PRS Tech Copy-Rename Utility. Configure your personal preferences using the Copy-Rename Control Panel. Create up to three of your own custom naming conventions. Select the option to place the copy in a seperate sub-directory. Check the option to allow overwriting the copy if you prefer. Start making copies with one click from Windows Explorer.